Yesterday, Ucore Rare Metals Inc. (CVE:UCU), (PINK:UURAF) stock bounced off the bottom unexpectedly, just like it fall down there also that unexpectedly. With a small one-week delay after the release of the company's recent developments, the share price of Ucore Rare Metals Inc. rose, maybe consolidating in expectation of the next momentum. On the TSX Venture Exchange, UCU jumped up by 11 cents, or 25%, to $0.55 within the session. The heavy volume traded on the buying pressure was a confirmation for the willingness of investors to reevaluate the share price. On the American OTC market, the company's shares were also in an upward direction. UURAF soared 26.99% between the sessions on a volume of almost half a million shares changing hands. At the end of last month, two days before the released update on the research of the bulk samples obtained from the Bokan-Dotson Ridge heavy rare earth project in southeast Alaska, the share price dropped down 8.3% on no news. The most frustrating fact was that this decline was confirmed in six and a half average volumes turned over during the trading session. After that drop off, no other news from the company were able to restore the good performance of the shares. 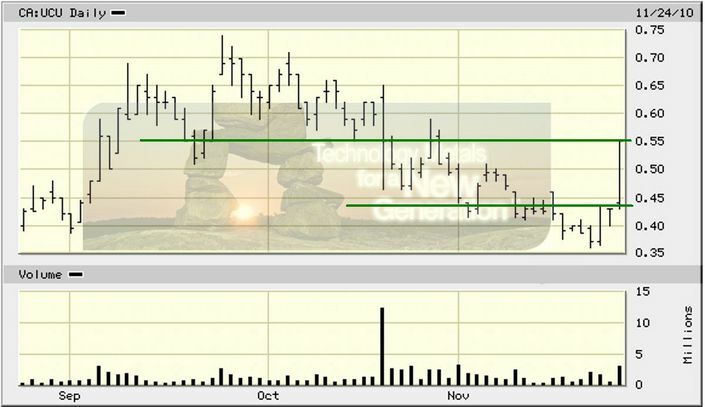 Two weeks ago, Ucore Rare Metals Inc. sent to investor its next in row not exactly positive message. The company arranged a brokered private placement for gross proceeds of up to $10 million in order to progress the exploration of its properties, the main focus being on the Bokan Mountain project. On the same day, the share price returned back by 10.64%, as opposed to the expectations. Looks like this week investors were devoted to advancing the share price of Ucore Rare Metals. After being almost resistant to the company's recent developments, UCU stock got finally rushed.